Education is a natural process carried out by the child and not acquired by listening to words but by experiences in the environment. What Does a High Quality Preschool Look Like? 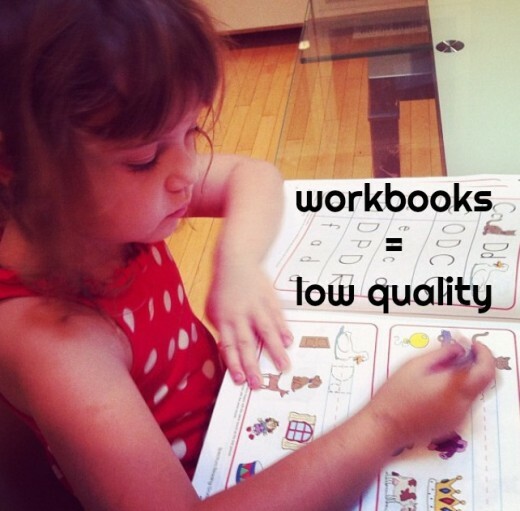 Do you see math and handwriting workbooks as a sign of a quality preschool? Are you impressed by teachers who command the children's attention at lengthy circle times, going through the paces with the calendar, the weather, and the days of the week? Are you excited that your child will come home with adorable craft projects that you can display: a turkey made from a hand-print, a crocodile created from an egg carton, and a spider twisted with pipe cleaners? Do you see preschool as a time to prepare your youngster academically for kindergarten? If “yes” is your response to these questions, you're way off track in determining what constitutes a high quality preschool. Like many parents today, you think an adult-centered classroom is superior to a child-centered one. What you see as signs of excellence are the exact opposite of what most authorities in early childhood education recommend. When looking at preschools, you want to find a place that adheres to developmentally appropriate practices (DAP), meaning kids are allowed to be kids: playing, creating, pretending, and exploring. The teacher is not front and center, filling the kids with knowledge, but is an inconspicuous facilitator, encouraging their curiosity. That's what is necessary to develop children who are critical thinkers, self-motivated learners, and happy, well-adjusted individuals. Open-ended art (painting, drawing, printmaking, creating collages, and sculpting with clay) is emphasized because it stimulates the 3 i's: initiative, independence, and imagination. Teacher-directed craft projects are minimized because they do the exact opposite, encouraging duplication and not originality. The artistic process is seen as far more important than the finished product. Creating art is celebrated as a relaxing and joyful endeavor that's extremely beneficial to one's overall well-being. The teacher encourages children to do art but never coerces them. If a youngster is engaged in another activity (building blocks, riding a tricycle, putting on a puppet show), she's never forced to abandon it to do art. Creating art is always a choice, not a requirement. Children have the option to paint at the easel every day, either inside or out. It's seen as a way to express one's self, experience downtime, and enjoy peace and quiet. There are no coloring books in the classroom. Crayons and paper are always available for children to draw what they'd like from their own imaginations. 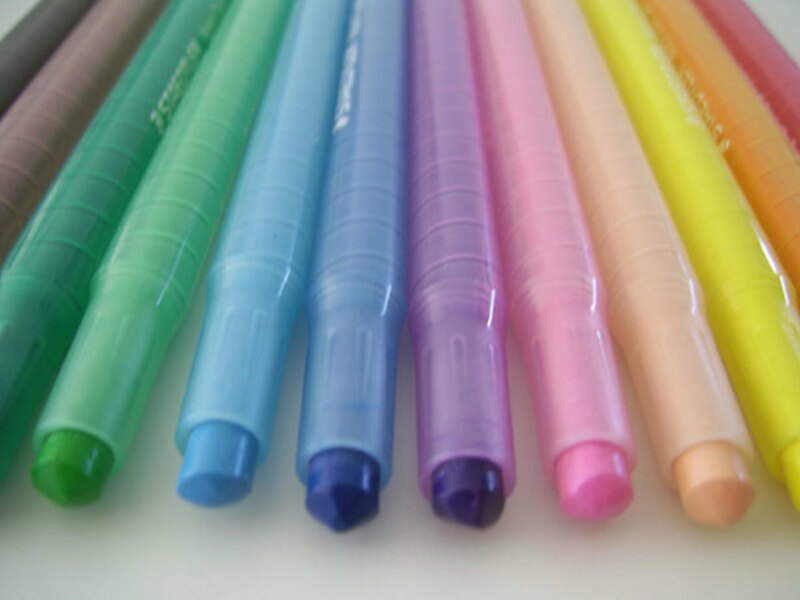 Children explore with various materials: paints, crayons, colored pencils, markers, collage materials, chalk, clay, printmaking supplies, and glue. Art is original and reflects the uniqueness of each child. Youngsters do not follow step-by-step directions to make cookie-cutter projects such as paper bag bunnies or cotton ball snowmen. There are no teacher samples to copy. Children don't get frustrated because theirs doesn't look as polished as the teacher's. They don't have a preconceived idea of how their art should look. 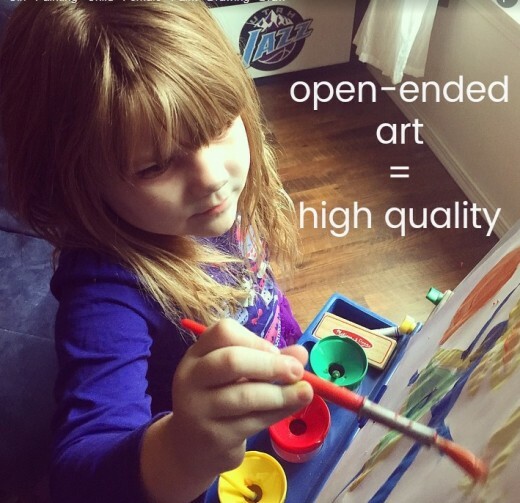 The teacher educates parents about the benefits of open-ended art. Moms and dads know the reasons why their youngsters won't be coming home with a plethora of craft projects and fully support it. 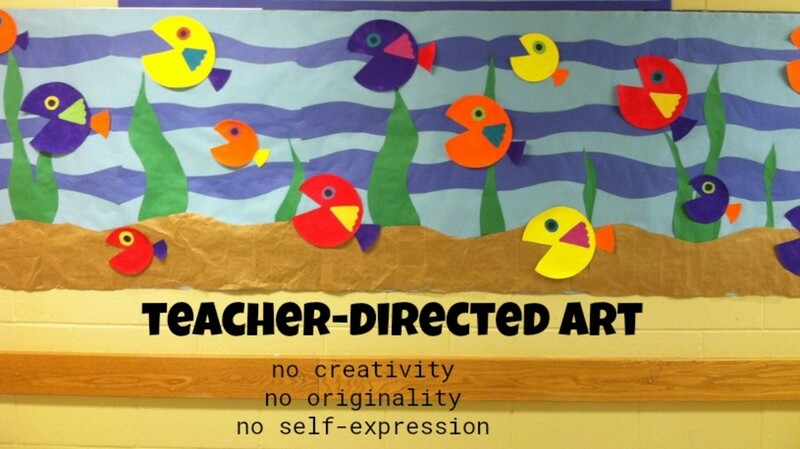 Bulletin boards display a wide-variety of open-ended art that reflect diversity, not uniformity. 11. A 4-year-old's attention span is about 15 minutes so circle time doesn't last longer than that. 12. The teacher doesn't use circle time as her primary means of instruction. Research shows young children learn more during small group activities and unstructured play. 13. The teacher doesn't use circle time as her personal stage, expecting the children to sit quietly and listen while she performs. She involves them. 14. Circle time includes music, movement, and games and is entirely child-centered. 15. The teacher articulates to parents the limitations of circle time and explains the advantages of small groups: Children do hands-on learning and exploration. They ask questions. They don't have to wait their turn. They learn from one another. They learn by doing. Although phonological awareness is taught when a child enters the school system, research shows that the more a child knows before he or she enters school, the faster they are able to learn to read, write, and spell. In fact, these fundamental skills are strong predictors of literacy performance in subsequent years. Many researchers believe that phonological awareness in early childhood is more important to literacy than other variables such as socioeconomic status or intelligence. 16. The teacher is knowledgeable about phonological awareness as a prerequisite for reading. 17. The teacher integrates phonological awareness into the day in a fun, playful, and organic way. 18. The teacher knows that phonological awareness is void of print so workbooks and worksheets are unnecessary. It involve hearing and manipulating the sounds inside words. 19. The teacher reads rhyming books, poems, and nursery rhymes that involve language play and alliteration. 20. The teacher plays children's music that contain rhymes and word play: Hap Palmer, Raffi, Dr. Jean, Joe Scruggs. The class sings rhyming songs, does finger plays, and recites poetry. 21. The teacher exaggerates words so each sound is heard: cat becomes kuh-aaa-tuh. She talks about beginning, middle, and ending sounds. The children clap the syllables in words: cat = 1, hamster = 2, Dalmatian = 3. 22. The teacher uses small group activities to teach about phonological awareness. Games are used. 23. The teacher knows that learning the letter sounds is more important for reading than learning the letter names. 24. The teacher goes through all the letter sounds each day. She does not use the popular but ineffective “letter of the week” approach. 25. The teacher explains to parents what phonological awareness is and why it's important. 26. Learning about math is enjoyable, meaningful, and hands-on. 27. The children explore and experiment with a wide-variety of math materials during small group activities and open-play periods. They learn by doing. The teacher guides them by asking questions. 28. The teacher integrates math into the day so it's seen by the children as part of the real world. 29. Math is play. Children learn math concepts during open-play periods: using the cash register at the store, stringing beads in patterns in the art area, sorting bugs at the science center, using measuring cups and spoons in the kitchen. 30. Blocks are always encouraged at open-play periods. They teach math concepts such as problem solving, adding, subtracting, grouping, and geometry. 31. Math manipulatives (pattern blocks, unifix cubes, counters, geoboards) are plentiful and the children have lots of time to play with them in many ways. 32. Children learn about measurement by playing with cups and spoons at the water and sand tables. 33. The class counts throughout the day with a purpose. They count the kids at school. They count the different foods at snack. They count the number of items brought for Show and Tell. 34. The teacher articulates to parents how children learn math in a developmentally appropriate way by moving from the concrete (manipulatives) to the abstract (numerals). 35. The teacher does not rely heavily on calendar activities to teach math concepts. Patterning, counting, and sequencing are better taught with hands-on activities in small groups. Children below first grade find calendar activities largely meaningless because their notion of time is not yet mature. 36. The teacher is a role model for pro-social behavior (actions speak louder than words) by being kind, patient, sympathetic, and helpful. 37. The teacher circulates throughout the classroom during cooperative play time (as opposed to doing a project with a small group of students). She helps the children build pro-social behaviors: using words to settle conflicts, working together as a team to build and create, and sharing toys and materials. 38. The teacher helps children understand what non-verbal communication is (facial expressions, body language) and how to read it. 39. The teachers understands the children are making an important transition from parallel play to cooperative play. She gives them an hour or more of uninterrupted play each day to promote social skills. 40. The teacher communicates to parents that building pro-social behaviors takes time and practice. Most children don't appreciate the true value of sharing until they're 5 or 6 (until that age they do it because adults tell them to share). It is in the outdoors that children are likely to burn the most calories, which helps prevent obesity, a heart disease risk factor that has doubled in the past decade. With studies showing that as many as half of American children are not getting enough exercise-- and that risk factors like hypertension and arteriosclerosis are showing up at age 5-- parents and teachers need to give serious consideration to ways in which to prevent such health problems. 41. Children play outside every day. Outside time is never short-changed. It's never withheld as punishment. 42. Outside time is for unstructured play. The teacher encourages students to make up their own games and rules, set up obstacle courses, and use their imaginations. This time is not used for structured teacher-led games such as Duck-Duck-Goose and Red Light/Green Light. 43. The teacher articulates the value of outside time to parents: It promotes exercising, socializing, sharing, taking turns, cooperating, and problem solving. 44. Children wear casual clothes so they can move freely and get dirty. 45. 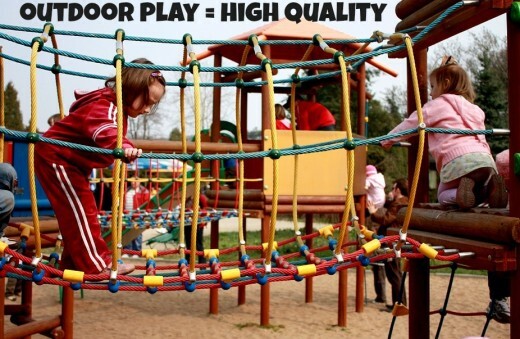 The outdoor area has equipment for climbing, running, throwing, catching, and swinging. Small Group Activities Are Where Real Learning Takes Place! 46. Most learning takes place during small group activities, not whole group circle time instruction. 47. Small group activities include cooperative learning projects as well as autonomous exploration. The children learn from one another. They learn by doing. 48. High-interest activities promote curiosity and exploration. The teacher acts as a facilitator. She asks lots of questions, especially ones that start with how: How can you make that bigger?How can you use that in a way it's not intended? How can you make that symmetrical? 49. The teacher adds materials and activities that appeal to the children's interests. If a child is interested in dinosaurs, she'll put out dinosaurs. If a child is interested in magnets, she'll put out magnets. 50. There are always materials and activities that promote small motor development so children will be ready to hold a pencil correctly when they begin elementary school: play-dough to squeeze, stickers and stamps for creating, beads to string, pegboards to decorate, and Legos to build. Looking for a Preschool? Read This Book First! As a former preschool and kindergarten teacher, I can't say enough wonderful things about this book. We need Nancy Carlsson-Paige as a voice of reason and advocate for our young learners. 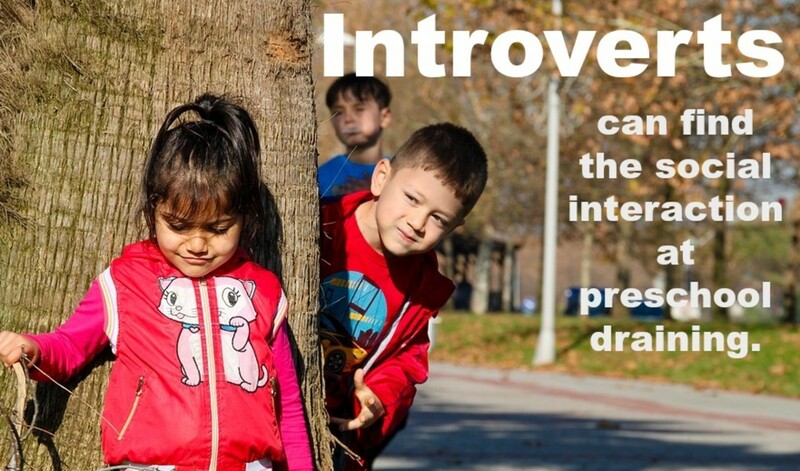 Too many experts in early childhood education have gotten silenced in our country's push for “academic rigor.” Nancy does a fantastic job of explaining why kids need more imaginative play and down-time and fewer teacher-directed lessons. I highly recommend this book for parents looking for the right preschool. What is the most important role preschool plays in a child's life? It prepares her socially to make friends, share, and take turns. It prepares her academically for kindergarten. It develops her fine and gross motor skills so she'll be able to write with a pencil and cut with scissors in kindergarten. It gives her a positive start in her learning journey. I don't believe in preschool. 3 Easy Steps to Teach Your Child to Read and Keep Reading! Why the Best Preschools Prepare Children for Life, Not for Kindergarten! Hina, I'm glad you found a preschool that has so many of these qualities. They're very hard to find here in the US as preschools become more focused on preparing children for kindergarten and less about playing, exploring, and socializing. However, there is a trend here toward "outdoor schools" and "forest schools" where kids spend most of their time in nature. It's a step in the right direction. Enjoy your boy! 100% agreed, I have personally admitted my son in Nordic International School and so far I am happy with the progress. They possess most of the above mentioned qualities. Its run directly by Swedish faculty and it is one of the best pre school in Lahore, Pakistan in my opinion. Yes I agree a warm and loving teacher makes all the difference to the child. You're so right, Pathways Preschool. A warm, loving, and inspiring teacher makes all the difference. However, the school's program must allow her to shine. If the adult to student ratio is too high or if the owner demands too many structured activities, she'll become frustrated and defeated. There's a huge turnover rate for preschool teachers because of the lack of respect and low wages. Parents may choose a school because of a certain teacher, but there's no guarantee she'll stay around. This article puts little emphasis on the role of the teacher and the relationship they have with the children, which many studies have shown to be the biggest indicator for high quality early childhood education. There is some great info here but it seems this article is missing a big point.